Will Knight | History, Nature, Fish | Thinking out loud, quietly, about history, nature, and fish. Thinking out loud, quietly, about history, nature, and fish. The Pacific Biological Station in Nanaimo BC. In 2007, Stephen Bocking, professor of environmental studies at Trent University, asked me to conduct some research on British Columbia’s aquaculture industry. The plan included a visit to British Columbia to consult the collection at the Department of Fisheries and Oceans (DFO) library at the Pacific Biological Station in Nanaimo on Vancouver Island. As a budding historian of Canadian fisheries, I was excited to visit this site. 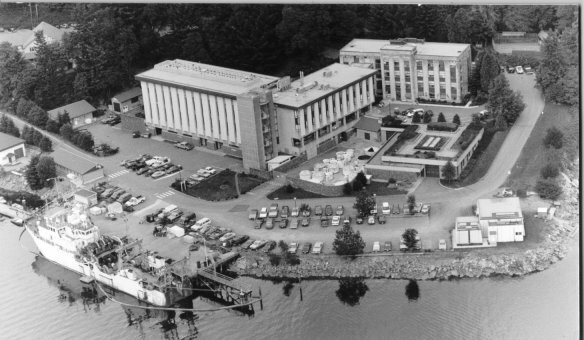 Established in 1908, the station was the third biological research station in Canada and the first on the west coast. Its library—in existence since the station’s inception—proved to be a treasure trove. A darkened room with close-packed shelves, the library looked like a working scientist’s lumber-room overflowing with material. It was a particularly rich repository of grey literature: scientific reports and studies printed and distributed in limited quantities, and which are usually difficult to track down. These were squeezed onto shelves and, in truth, made me despair that I could navigate this daunting terrain. Over the course of several days work and with the help of the librarian, however, I found material that supported Stephen’s research project, which led to his publication of new analysis. I was also side-tracked by shelf-reading, a problem familiar to most researchers. You begin wandering along a shelf, randomly pulling out books and reports, leafing through them without any discernible purpose. This is how I found, for example, Stella and Edgar Worthington’s Inland Waters of Africa (1933), an untapped source for a yet-to-be written history of English colonial fisheries administration. This serendipity and freedom are intangible qualities that physical libraries foster and which digital archives, which are undoubtedly valuable, do not reproduce. And it is one reason, among many, why the library’s closure—one of five libraries that DFO has shuttered—is so troubling. DFO claims that the closures are cost-saving measures; the collections from the five closed libraries will be consolidated in two existing libraries. The lack of physical access will be offset, officials promise, by the digitization of materials. There remain, however, many unanswered questions. Foremost are concerns that valuable research has been lost, a concern that historians must also share. The photograph of a dumpster filled with books and reports taken from a DFO library in Quebec has only sharpened anxieties that “consolidation” has resulted in an indiscriminate purge. There are also questions about digitization, the rationale used to explain cuts to Library and Archives Canada in 2012. What materials have been digitized? What have simply been discarded? There are no clear answers to these questions. The promise of open government through digitization is also, apparently, a contingent one. A case in point is the Cohen inquiry into the disappearance of sockeye salmon on the Fraser River. The Cohen commission, which reported in 2012, questioned the wisdom of salmon aquaculture in British Columbia. Among its recommendations was removing from DFO the mandate for promoting salmon farming, which Justice Bruce Cohen found conflicted with DFO’s responsibility for wild salmon stocks. But if you want to read this report, you are out of luck: the Cohen commission website has been shut down. Given the commission’s cost and importance, those findings should still be available for public consultation. (Fortunately the Watershed Watch Salmon Society has posted the report here.) That the government shut down the commission’s website raises questions about its commitment to transparency and access, questions which the library closures only magnify. First reported in the Nanaimo Daily News in October 2013, the closing of DFO libraries has gained much more attention in the last several weeks. They also include the Eric Marshall Aquatic Research Library in Winnipeg and the recently renovated library at the St. Andrews Biological Station in New Brunswick. Andrew Nikiforuk, reporting in The Tyee on the closures since early December, has uncovered much of this story (see here and here ). And as he has pointed out, DFO libraries are not the only ones affected: other federal libraries have also been closed. The library closures, as Nikiforuk and other commentators have noted, fit a larger pattern of the Canadian government restricting the production, circulation, and communication of scientific knowledge. From the abolition of the long-form census to the closure of the Experimental Lakes Area, the Harper government has demonstrated fear and nervousness when it comes to science and evidence, particularly when they threaten industrial development. The closures also fit with the government’s gutting of environmental protections, particularly in the Fisheries Act, and their subordination to industrial interests. The latest instance, as reported by the website Northwest Coast Energy News, is the delegation of the Fisheries Act to the National Energy Board (NEB) in respect of the Northern Gateway oil pipeline. The NEB will now assess if the pipeline project affects fish habitat and decide on any remediation measures. The NEB will also deal with Aboriginal fisheries questions. You might reasonably ask what library collections have to do with fisheries regulations. Indeed I can understand the desire to consolidate collections; there may well be a case for the ones now taking place. But when dumpsters figure as an instrument of library rationalization, public outcry is justified. More critically, the destruction of libraries underlines what many scientists and researchers already know, that the circulation of knowledge is something this current government wants to restrict. The crew of the “Neptune” claiming the eastern Arctic. Andrew Halkett is third from right. Library and Public Archives Canada. Writing is an iterative act: editing always follows a draft, which is usually followed by further re-writing and re-editing. The goal is a well-shaped arrangement of words—a narrative with a sense of direction and purpose. This makes writing kin to gardening and in bad moments to clear-cut forestry. Sometimes one has to completely root out a section: when that excision works, the relief is palpable. But there’s always the question of what to do with the written cast-offs. Do you burn them? Throw them on the compost? The Neptune left Quebec in August 1903 and cruised the Arctic archipelago between Hudson’s Bay and Ellsemere Island and overwintered in Fullerton Harbour. Throughout the voyage Halkett collected specimens of invertebrates, mammals, birds and some fish. To Halkett, whom expedition leader Low described as “indefatigable in the work of collecting specimens in all branches of natural history,” fish seemed the least interesting animals he encountered. This was a bit of a problem for me as Halkett was the fisheries museum curator: why was he not collecting fish? Birds and invertebrates were more interesting to him and he finished the expedition with a larger bird collection than that of fish. Sigh. Why don’t historical actors behave like they’re supposed to? The more interesting aspect of this expedition wasn’t so much the collecting but the performances that declared Canadian sovereignty. At several points during the voyage Low, accompanied by the ship’s company, landed to carry out the formal symbolic performances of sovereign possession. 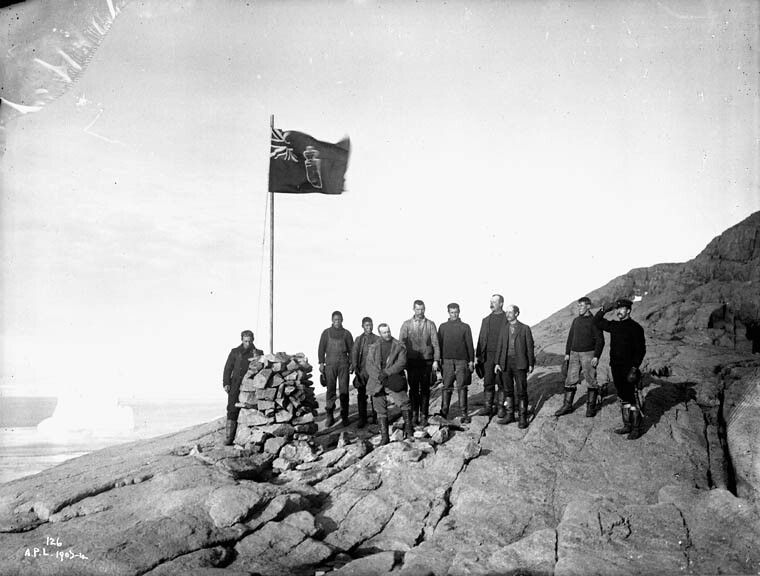 “It took little time to attend to the duties of the landing at Cape Herschel,” reported Low, “where a document taking formal possession in the name of King Edward VII, for the Dominion, was read, and the Canadian flag was raised and saluted. A copy of the document was placed in a large cairn built of rock on the end of the cape.” At another location the performance was repeated: a flag was hoisted and a copy of the territorial proclamation and the customs regulations were left in the wreckage of a ship left by an earlier expedition. These are acts of social magic (as Pierre Bourdieu called them): a spoken-word performance entailing the burial of a sheet of paper under some rocks or in the shattered remains of a boat. It’s like a play by Beckett and as absurd that it was only these acts that were required to consecrate the Arctic as Canadian. 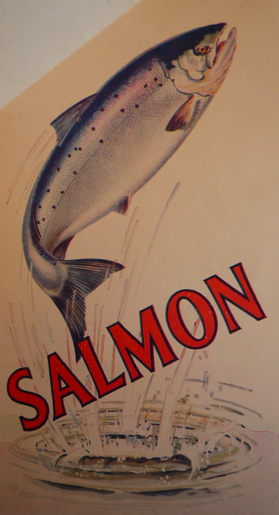 This is the cover for the menu offered at the CNE fish restaurant (1914-1918). It was designed by Frederick William Wallace editor of The Canadian Fisherman and author of Wooden Ships and Iron Men. Why does time seem to accelerate in August? There is no sense in complaining as it happens every year, but I feel it a little keener as I stretch for the dissertation finish-line. In late June I completed what I thought was the penultimate chapter in my thesis: a survey of international and national fisheries exhibits. That is until I decided to split it into two chapters; instead of one completed chapter I had two unfinished ones. The pain passed when it dawned on me that I had a strong chapter on an unrecognized aspect of fisheries history, and that was consumption. We focus on catching and all the conflicts that it entails–but have neglected the other end of the commodity chain: eating. In researching fisheries exhibits, I came across a fish restaurant run by the Canadian fisheries department, and which was mounted annually at Toronto’s Canadian National Exhibition between 1914 and 1918. Jennifer Hubbard mentions the restaurant in passing in A Science on the Scales and classifies it as a wasted public relations exercise. She faults the department for issuing cookbooks and serving dinners at fairs, rather than focusing on science. The restaurant, however, struck me as indicating a shift in focus from production to consumption—and as tolling the end of the fisheries museum, which was demolished in 1918. In the chapter, I argue that the restaurant was a form of exhibit: instead of inviting fair-goers to gaze at fish, the restaurant beckoned people to taste them. Both modes sought to inspire confidence in fish as food and the government’s administration of fisheries. The chapter also looks at wartime food rationing. The restaurant was part of a wider campaign to promote fish as food and the war provided a patriotic rationale to extend the campaign. I also delve into the gender politics of the fish-as-food campaign; women, for example, were blamed for suppressing the national appetite for fish because they didn’t know how to properly prepare or cook fish. This chapter would make a great article—but time is slipping away this summer so it will have to be a fall project. I am now working to complete the orphaned chunk that remained after this fish restaurant narrative crystallized into its own chapter. Time for that now seems in short supply. Next week, Beth and I travel to Nova Scotia to visit friends and family there, and in PEI. I also have meetings arranged at the Maritime Museum in Halifax and the Lunenburg fisheries museum to look at some models that once belonged to the fisheries museum. I also hope to eat some fish myself. My father-in-law is a dedicated trout fisherman; together we will conduct some ‘field work’ and survey eastern PEI’s brooks and ponds for speckled trout. 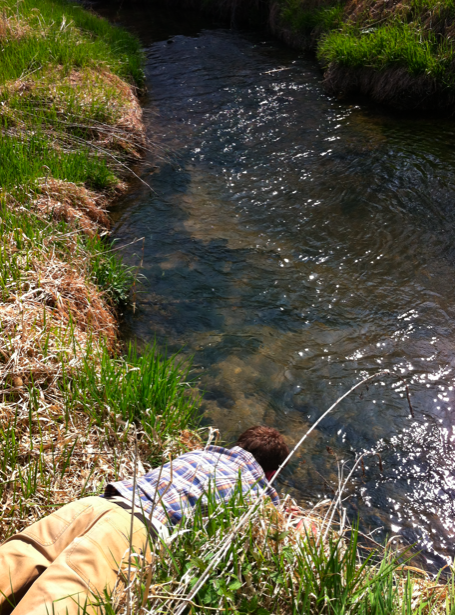 Andrew Cardinal bathing his forehead in a cold clear Wisconsinian stream. There were trout and brook lampreys. If you scratch an environmental historian you’ll find a nature lover under the surface. Many of the ones I know—myself included—have an origins story that roots our occupational choice in an early appreciation for nature. I recognize that I am using “nature” here as an entirely unproblematic concept—something which few environmental historians would accept as we recognize nature as an historically flexible set of ideas. Yet even as I “problematize” nature in my work, I draw unproblematically on it as a deep source of pleasure and solace. This struck me forcefully after returning from a canoe trip to Algonquin Park this past week. I woke the first morning back in Ottawa with a Zen smile hovering above the placid pool of my brain. Five years of not paddling and not portaging made the trip a challenge: I was clearly out of shape from doctoral study. After cresting a long slope on a long portage I dropped to the ground to rest; my heart was pounding so hard I was sure it was going to leap out of my chest. Five minutes—or was it 15?—of blessed peace in the spring sun among blossoming trout lilies followed. That pause, and its companion moments during the trip contemplating clouds, butterflies, trees, birds, rocks, reptiles, water, mammals, moss, and fish, infused me with joy. Despite an aching back and sore hips, and Algonquin Park’s inescapable history, I was thankful. I recognized my privilege even as my historical consciousness lapsed into momentary silence. There have been moments during these years of Masters and PhD study that the acids of inquiry have corroded my love of nature. But this has happened before and academic study wasn’t the cause: one summer as a commercial fisherman turned me away from the pleasures of sport-fishing for several seasons. Catching fish for a living made the recreational form seem trivial. And the waste and racism I witnessed were demoralizing. But I returned to fishing and with a different perspective that has since directed my work. Being in nature and querying it are not mutually exclusive: we must in any case learn to live with our contradictions. Besides there is no pleasure like idleness—which Izaak Walton pleased to call ‘contemplation’—for it is the very soul of angling and the condition for thinking. This past Monday I took part in a NiCHE New Scholars reading group. This group has been meeting for three years to discuss works-in-progress by its members—graduate students in environmental history in Canada, United States, and even some from overseas. I contributed the first paper to the group’s initial meeting in August of 2009 (a piece of writing left on the cutting room floor of my MA) and so I felt a measure of the distance traveled since when I offered up a thesis chapter for discussion. The chapter was my second and it was written in the summer/fall of 2011 before I performed radical scopic surgery on my dissertation. Feeling lost in a large and baggy topic I narrowed my thesis from natural history museums in North America to a single institution, the Dominion Fisheries Museum in Ottawa, Canada. That painless amputation was performed just inside the new year, so it was interesting to look at this chapter on exhibiting and collecting from a new perspective. I was initially shy about letting people read the chapter. It was long and rambling—and honestly doesn’t feel like it has one argument but several and I’m not sure if any actually dovetail. I’m happy I let that go. With a roundtable of probing yet receptive colleagues I felt both confirmed and challenged. Confirmed in my decision to split the chapter into two; one dedicated to collecting and the other to exhibiting. Challenged because there is so much work to do out before I can fill in the gaps that my readers so assiduously revealed. In our discussion I felt like I rambled and stumbled. In hindsight the conversation was entirely valuable if not therapeutic. Talking something out is often an excellent way to thrash one’s way out of an emotional or intellectual thicket into a clearing. And so here I am in such a clearing: working hard on my final chapter (final in regards to its order in the thesis not final as in the “last”). And with a dawning sense of order that I know is immanent in the chapters I have written—but which only a hard and relentless revision will actually reveal. That order includes acknowledging that while my thesis is about the Dominion Fisheries Museum it is not only or just a biography of that institution—it is also an attempt to historicize that thing we call the “fisheries” which we take as a self-evident category of activity and analysis. I hope I am adding something new about that by looking at how fish were displayed in the fisheries museum. Or, as I’ve put it elsewhere, how fish were conceptually and materially modeled at this “lost” museum. I want to thank my colleagues for their participation. Lauren Wheeler (Alberta) hosted the call for a group that included Hank Trim (UBC); Rob Gee (U of Maine scholar visiting Dalhousie); Mike Committo (McMaster); Michael Del Vecchio (Western); and David Harris, my friend who skyped in from Melbourne, Australia. Next week I hope to write about the tension between writing chronologically and writing thematically. I hoped to address that question in this blog but it will have to wait. I confirmed the location of another artifact that once belonged to the fisheries museum: a schooner model that is now in Halifax’s Maritime Museum of the Atlantic. 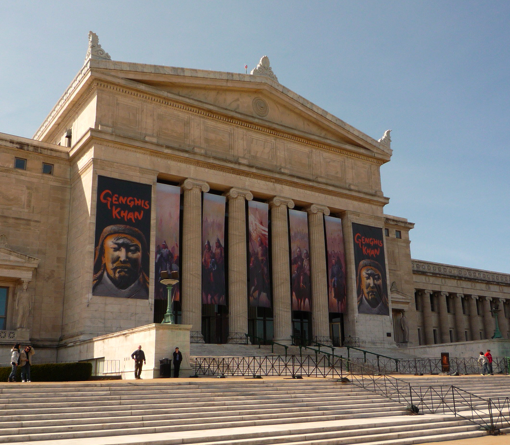 The Field Museum in Chicago. 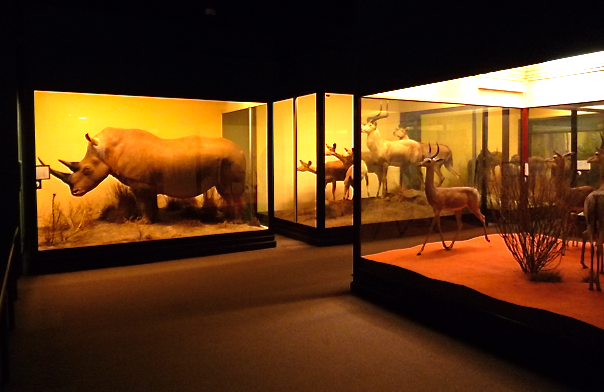 After my presentation at the ASEH annual conference in Madison I was posed an interesting question: how can natural history museums continue to exhibit habitat dioramas as if they were unproblematic displays? 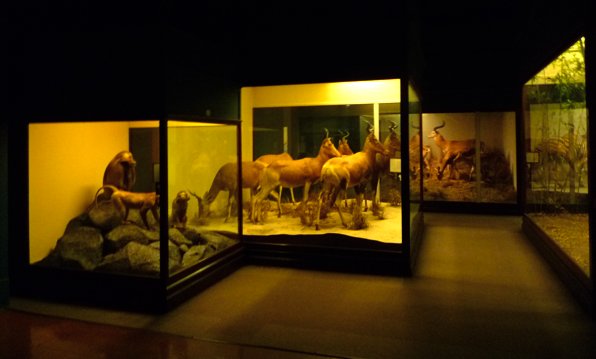 The questioner’s implicit assumption—and one that I agree with—was that natural history museums promote dioramas as emblematic fusions of art and science which transport visitors “closer to nature and to the essence of the animal.” (Metzler 11) And indeed this was my experience as a child transfixed by the mammal dioramas at the Canadian Museum of Nature in Ottawa. 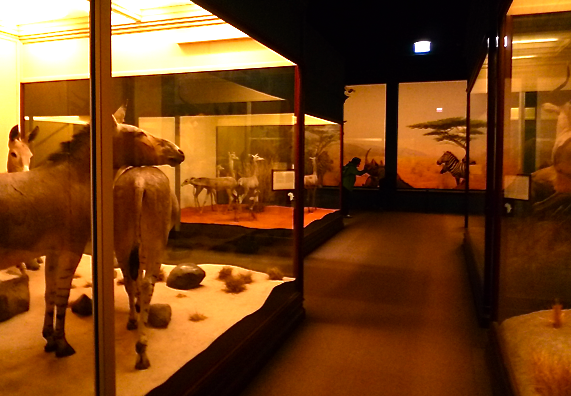 This same spirit animates the presentation of dioramas in Chicago’s Field Museum, which I visited after the Madison conference. 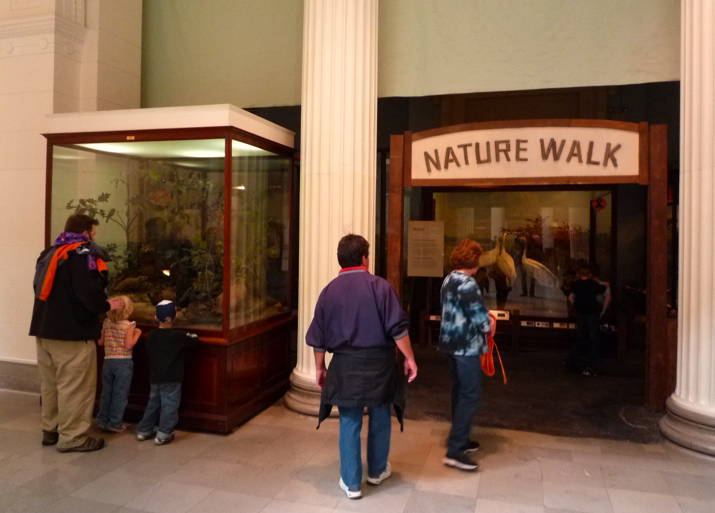 A rustic archway shepherds visitors into the diorama hall with the promise that they are about to enter a “Nature Walk.” Historians of nature are well aware of critical reflections on museum practices. Donna Haraway’s “Teddy Bear Patriarchy” is perhaps the most notable, but natural history museums appeared to have buffered themselves against such analytical acids. 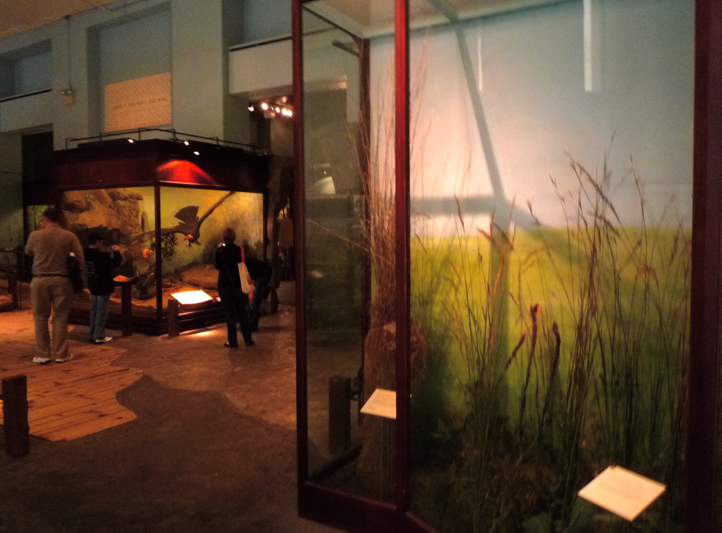 Museums, I think, would reject describing their dioramas in accompanying text panels and labels as Haraway might. But the time has certainly come to acknowledge dioramas for what they are: historical objects in their own right. Diorama labels, however, are largely silent on who created the scenes and in what conditions or contexts of production. That includes acknowledging not just the rich patrons, the sportsmen, who shot the animals but also the preparators who hand-cast each wax leaf on a tree in the diorama’s background. And also the animals: where and when were they shot? Or how otherwise killed? These can be simply acknowledged. The Field Museum is an interesting case. Sally Metzler’s book Theatres of Nature: Dioramas at the Field Museum (Chicago 2007) gives the date for each diorama and names the collectors, taxidermists, and painters who made them. Although the text uncritically celebrates dioramas, these notes help contextualize dioramas as historical constructions. This has me thinking about a possible digital history project that would undertake this job—an app that would reframe dioramas in a museum of museums and that would acknowledge these displays as historical objects that speak volubly about the pasts of natural history and museum keeping. Since I haven’t mentioned fish in this post, I will here. One of the issues that I am examining in my thesis is the display of fish in natural history museums. Fish were much more difficult to assemble into habitat dioramas although museum preparators certainly tried. I will save this for a later post but I do want to explore the material and conceptual obstacles that cropped up as museums attempted to model fish in similarly affective ways as dioramas. I’ve posted some photos taken during my visit to the Field. I was struck by the freestanding glass cases in the Field. 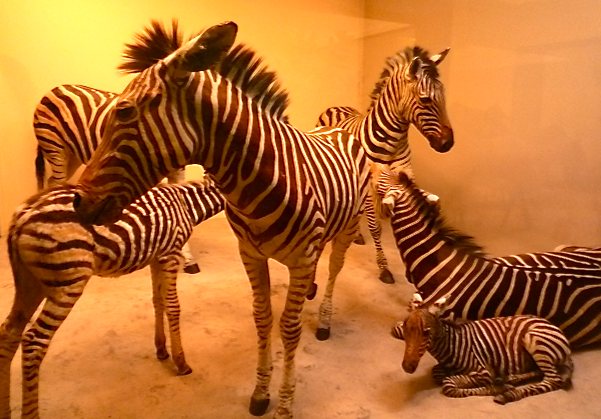 These are an older style of display in contrast to the recessed and curved wall niches that characterize habitat dioramas after about 1924. 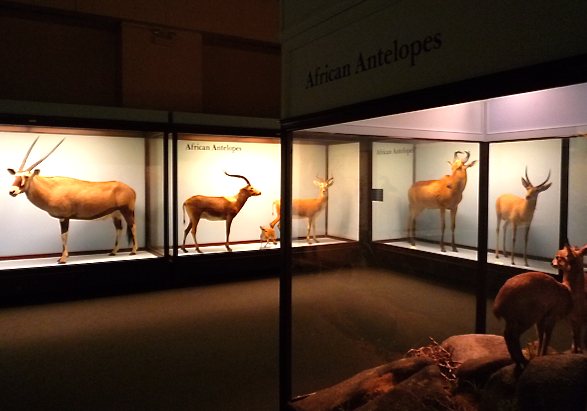 The cases containing antelopes and other African animals are also interesting: they contain almost no accessories or are minimally dressed with no background paintings. They would not look out of place in a museum of modern art, standing in an group show along with the works of Damien Hirst or Mark Dion or even perhaps Duane Hanson. I am back—and feel like I am still returning—from the American Society for Environmental History‘s annual meeting in Madison in late March. The conference is a great opportunity to catch up with friends, colleagues, and their research. This year’s meeting was no exception. It was busy conference for me as I was involved in a panel and a workshop. The most obvious outcome of the conference is this blog. I am finally taking Sean Kheraj‘s advice to “take control of my Google!” That was the theme of his talk, “The Academic and the Internet,” which led off the workshop organized by myself and Andrew Case at UW-M. The workshop title—“Navigating Career Challenges in Difficult Times: Professional Development for Environmental History Graduate Students”—is self-explanatory and was planned directly after the 2011 ASEH conference in Phoenix. When Joel Tarr started a thread on H-Net on the “jobs crisis,” we felt ahead of the curve. And that perhaps he was treading on our territory. Hey—leave unemployment to the grad students! The workshop took place Saturday morning, March 31, and we had a great turnout. Along with Sean, panel participants included Todd Dresser at UW-Oshkosh, and Bob Blythe, an independent scholar from Chicago who writes parks histories for the U.S. National Parks Service. We had two well-attended sessions, which concluded with a lively roundtable discussion. Thanks to Andrew, Sean, Todd, and Bob for making this work. We had some great feedback and one fellow grad student reported that the sessions gave him hope! Kara Schlicting (the incoming ASEH grad liaison) and Andrew Watson (on the Toronto organizing committee) are already discussing plans for a grad student workshop for next year. If you want to talk to Kara or Andrew — send me a note and I will connect you with them. I’ve presented posters at previous ASEH conferences, but this was my first paper and my first stab at organizing a panel. “Exhibiting Nature: Seeking the Wet, the Wild, and the Dead” (cue Enrico Morricone) featured Karen Lloyd, Daniel Vandersommers, Robert Gee, and myself. Karen and I gave talks on habitat dioramas, while Dan gave a talk about prairie dogs–which was punctuated by much laughter about unruly animals—in the Philadelphia Zoo. Robert gave a paper on the Great International Fisheries Exhibition in 1883—a topic close to my own heart as it was the source for the Dominion Fisheries Museum, which is the subject of my dissertation. The panel was chaired by Tina Loo. I am PhD candidate in Canadian history at Carleton University in Ottawa, Ontario. I am currently writing a dissertation entitled “Modeling Canada’s Aquatic Nature: the Dominion Fisheries Museum and fisheries exhibits 1883-1955.” This project examines the conceptual and material modeling of fish and other marine animals in Ottawa’s fisheries museum. My primary fields of research are museums, fisheries, and natural history in North America in the 19th and 20th centuries. “Samuel Wilmot, Fish Culture, and Recreational Fisheries in late 19th century Ontario.” Scientia Canadensis: Canadian Journal of the History of Science, Technology and Medicine, 30, 1 (2007) 75-90. Download the article in PDF from Erudit here. 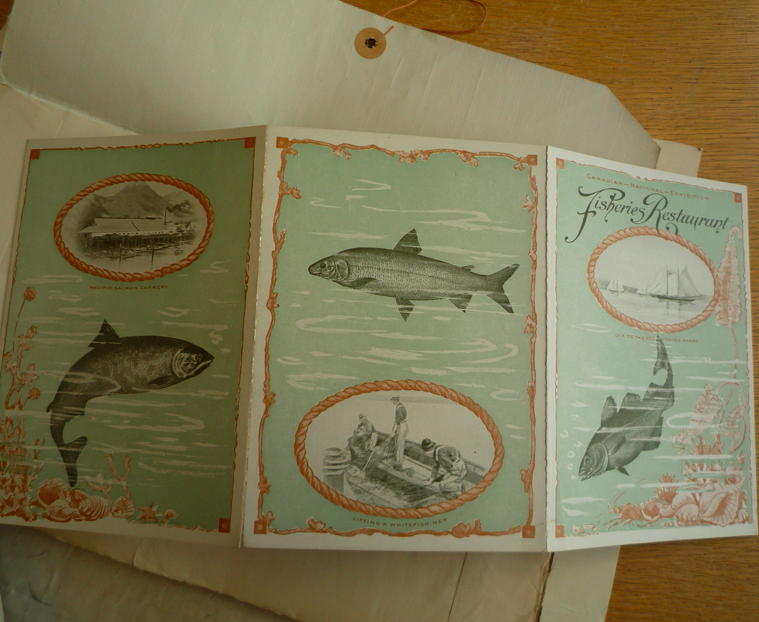 The Dominion Fisheries Museum in Ottawa: Lost and Found. This is a podcast of a talk I gave at the Ottawa Public Library, part of a four-lecture series entitled “Discovering Ottawa’s Environmental History.” This podcast was recorded by the Ottawa Public Library on February 16, 2011.